The Loanga Weaver (or Loanga Slender-billed Weaver) Ploceus subpersonata is restricted to the west coast of Africa. It is a small and slender-billed weaver. The male has an extensive black mask from the crown to the face, throat and upper breast, surrounded by golden-brown. The female is olive-green above, and dull yellow below with a buff wash. This species is slightly larger and less bright yellow than the Slender-billed Weaver P. pelzelni. 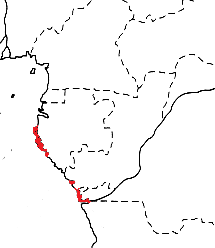 The Loanga Weaver is restricted to a narrow coastal strip from Gabon south through Congo, extreme south-west DRCongo and Cabinda (Angola, where the type specimen was collected) (see red on map right, based on Birds of Africa). In 2007 it was also recorded in northern Angola. Having a restricted global range, no subspecies are recognised. The The Loanga Weaver is rated as Vulnerable (one of 6 weavers are in this category) because it is a very poorly known species. Recent surveys, however, suggest that its range may possibly be more extensive, and its numbers may be larger, than previously thought. The Loango Weaver may be able to survive in urban or suburban areas, although at lower densities than the more common Slender-billed Weaver. The Loanga Weaver is usually found near water and inhabits swamp-forest, mangrove and savanna margins on the landward side, palm savanna and clearings in secondary forest, generally within 3 km of the coast; it also occurs in thick spiny palms and beach scrub. It is shy and skulking. Its diet is unknown, but its slender bill suggests that it is mainly insectivorous. The Loanga Weaver nests in a variety of trees, especially palms Phoenix reclinata, but also mangroves and once in a Eucalyptus tree. The breeding season seems to be either irregular or spread throughout the year. Nests have a retort shape, with an entrance tube of about 10 cm long. Much of this breeding information is based on a recent study of the species by Guillaume Passavy (see here). 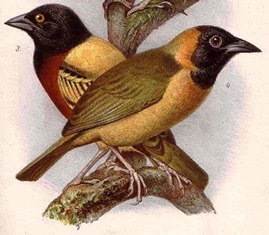 The Loanga Weaver has two PHOWN records (submitted by Guillaume), and many more records are needed for this species (see PHOWN summary). Submit any weaver nest records to PHOWN (PHOtos of Weaver Nests) via the Virtual Museum upload site.